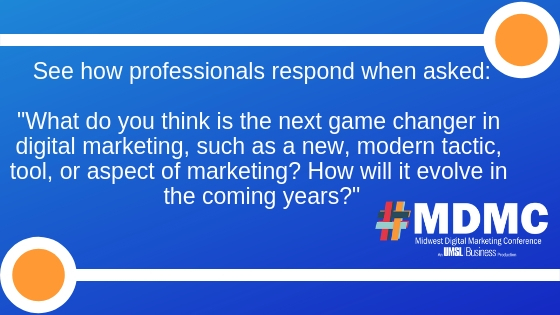 I'm not sure that it is a "game-changer" or new, but I think brands that continue to invest in their customer experience are going to continue to rule the marketing game. For example, Nordstrom has a service in their app that allows for curbside pickup at the click of a button once you are in their parking lot. Target and many others have also followed suit. Taking little extra steps to make your customer's journey clearer and easier are going to mean so much in the future. Consumers really just "shut down" when a buying process becomes too cumbersome. The next game changer in digital marketing is going to be better video storage. I KNOW, that sounds boring, but what I mean is, social media platforms will continue to get better at letting us shoot, store, and share videos. Customer Service is going to play a much bigger role in the upcoming years. We are going to see a bigger push for Social Media Call Centers that will be working on not only content, but creating a Customer Experience for people on social media looking for a brand. This is a hard one! There are some really cool interactive things going on and cool custom-tailored content and ad tech happening. I see this becoming an even bigger part of inbound marketing's information-rich, high-value approach to helping buyers vs. selling to them. Screenless interfaces, knowing how to use predictive analytics to solve problems and create opportunities with experience design, knowing how to innovate and using innovation tools. I think we're still at the forefront of how organizations can best utilize live-streaming video. It might seem like the live video fad has passed, as Facebook Live grows older, but I still think there are extraordinary opportunities for creative marketers to leverage live conversations, especially as Facebook itself further natively integrates tools that facilitate those conversations. I think schema markup will start to have a bigger influence in the SEO industry, especially with the rise of voice search. Now that you know everything about future changes in Digital Marketing, follow MDMC on Facebook, Instagram, and Twitter for updates about MDMC Speakers and keep up with details on the conference.